Reelcraft's Series RT is an economic choice for medium to light duty applicaitons. Reinforced steel construction with lightweight composite reel. 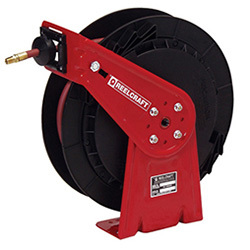 Quality Finish-Reelcraft hose reels are individually powder coated to off max protestion against corrosion. Designed for Industrial and Commercial Use. Reelcraft offers a full 2 year warranty against product defect. Dimensions are 18" x 7"
Refer to Reelcraft.com for full trouble shooting, installation and CAD drawings.